Gotisch is German for Gothic, the name is tied in with the colors of the shawl. 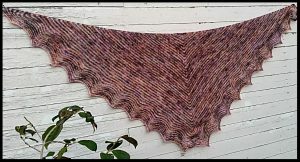 Gotisch is a fairly sized, striped triangular shaped shawl in textured color changes, and a feather and fan border. 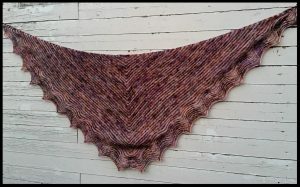 It is a lightweight shawl due to the mohair silk blend yarns. 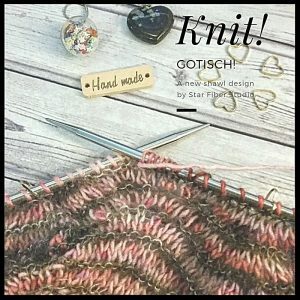 Gotisch is inspired by my inner Goth when you just want to wrap yourself in a textured comfy shawl, also perfect to wear just as an accessory in your wardrobe. It is designed to knit in two colors, and textures, but let your imagination take over. This is a written pattern, and that is also within reach of an adventurous new knitter if knitted a few items before. The stripes are very addictive to knit, just one more row. Handprint by Celine, Kid Silk Lace. Stitchmarkers 18 x, darning (tapestry) needle.